Vacation requests were approved and tickets bought. Beds were ready and the refrigerator stocked. Finally, the day came! Our three grandchildren were on their way for their annual summer visit. Fully prepared, Ron and I got to the airport extra early. We got our passes, went through security, and found our way to the gate. While other flights came and went, we grabbed a Starbucks drink and waited. Close to arrival time, we headed back to the gate. What a shock! Our grandkids were waiting for us, wondering if we had forgotten them. Clearly, this was not a strong start. Hugs broke the tension, and fears turned to laughter. Once home, we asked a risky question, “If you could do anything in San Antonio, what would it be?” Then we took an even greater risk and asked, “What part of the Bible do you want to read while you are here?” Without any pause, Annalyse, our ten-year-old, said, “Esther.” The Veggie Tales version had stirred her imagination. She wanted to learn more about this “beauty queen.” We all agreed, and every night that week we enjoyed time with Esther and God. Our position as the “grands” of our family gives us purpose and delight. 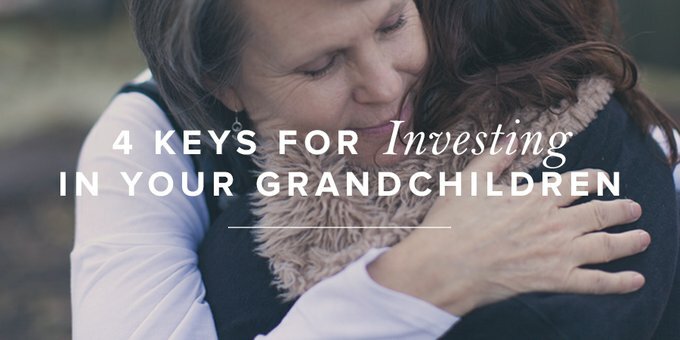 With life’s long-range view, we see four ways childhood is a uniquely designed time to invest in the lives of our grandchildren. Kids are impressed with people who are beautiful, intelligent, and have accomplished great things. Leave children to understand life from various teachers, video games, friends, movies, social media, and they will veer off into a world view that says the world revolves around me, my wants, and my needs. Kids are impressionable because God made them this way. Childhood is the time God has designed to capture their imaginations with the wonder of the gospel. Truth: Childhood is the uniquely designed time to impress kids with the gospel. Truth: Childhood is the uniquely designed time to build spiritually healthy kids. Children’s bodies are flexible and so are their minds. The world is waiting to squeeze a child into its mold. Smart phones give kids full access to the world—good, bad, and indifferent. Their opinion on everything from the latest styles to sexual identity is influenced by whatever website they’re on. God made your child’s mind and heart pliable for a reason. Children are not yet skeptical, judgmental, or cynical. They are ready to listen and believe whatever you tell them about God. Even at a young age, children can grasp something of the beauty of God’s character. Truth: Childhood is the uniquely designed time to bend a child’s heart toward God. With these truths in view, we set out to teach our grandchildren the gospel with our lives and words. We prayed that God would use both our daily activities and Bible reading for our grandkids to know Him better. By day we tubed down the Guadalupe River, hiked up Enchanted Rock, and talked about God’s glory in creation. At night, we rearranged activities to make Esther a priority. We simply read, and God brought the story to life. We giggled and marveled and shouted, “Yay, God!” when the tables turned on Haman. Reading God’s Word was fun. We watched in awe as God brought up different topics. While we and the older kids talked about Esther, Annalyse drew pictures to express what God had shown her. He stirred the kids’ minds and gave us wisdom we did not know we had! Our prayer time changed, too. We’ve always prayed with our grandkids, but now we heard each child responding naturally to God. And their requests showed heartfelt concern for each other. Ron and I wondered, what made the difference? Perhaps it was our honest sharing of what God was teaching us. We weren’t just looking for lessons for the kids. We were listening for God ourselves. God values children, and He “gifts” them to us. Psalm 127:3 tells us, “Children are a gift from the LORD; they are a reward from him” (NLT). Children do not really belong to us—they belong to God. He places children in our family, church, and neighborhood. We introduce them to God and show them with our words and lives what it means to follow Jesus. We don’t know enough to teach and train our kids to follow Jesus. The church will take care of this. We should wait till the kids are older. They’ll never sit still to listen. Whether your grandkids live right down the block or only visit once a year, God will equip you to disciple the children He gifts to you so they can know and believe the glorious truths of the gospel (Ps. 145:3–4). Psalm 127 also says that children are “like arrows in the hand of a warrior.” We prepare our children to follow Jesus and “shoot” them into the future to share the good news of the gospel with another generation. Truth: Childhood is the uniquely designed time to prepare a child to follow Jesus. Ron and I love our role as the “grands” of our family. We may not always be on time, but we respect time and want to make the most of every opportunity (Eph. 5:16). With the time we have left, we plan to reach the next generation in our family. God has made it our purpose and delight to take full advantage of the uniquely designed time of childhood. With the Lord’s help, we will use our words and lives to tell our grandchildren of His praiseworthy deeds so they will put their trust in Him (Ps. 78:5–7).